HOW LARGE ARE LARGE FORMAT TILES? We often mention large format tiles - in fact we have a page dedicated to them in our Tiles section, and a good selection on show in our showroom too. But just how large IS a large format tile? Well, there are a few common sizes, and remember that different tiles from different manufacturers will often have a small amount of variation anyway, especially if they are made of natural materials. The smallest tiles you're likely to encounter are the individual elements in mosaic tiles, which may be around 2cm or 1" across - and usually come in grids of 25, 36, or anywhere up to 100 individual tiles affixed to a flexible membrane for easier installation. Moving up through the sizes, you get brick-shaped tiles measuring about 10cm x 20cm (4" x 8") usually seen in kitchen splashbacks, and a host of familiar square floor and wall tiles measuring up to about a foot (30cm) along each side. Some wall tiles are bigger still, at up to about 1' x 2' (30cm x 60cm) and really this is the range beyond which you are into the realm of large format tiles. Again, different products will vary, and there's no strict definition of a minimum size for large format tiles - but you can usually tell just from looking at them that they are bigger than the norm. 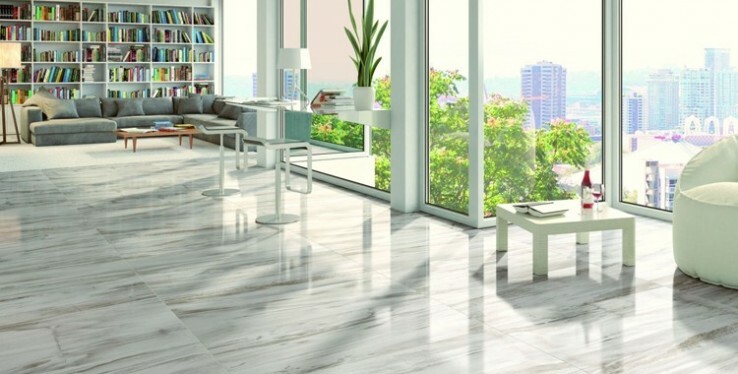 In our showroom, our large format tiles start from around 80cm x 80cm, or 60cm x 120cm for rectangular tiles, and range up to 80cm x 180cm, although we have other large format sizes to choose from as well. For a first-person look at how these sizes work in a realistic bathroom or kitchen environment, head to our Cheshire showroom, where we have a number of 'rooms' as well as some example sections of tiling to look at.